It is the farmers market that ruined me for all other farmers markets. When I lived in Madison, Wisconsin, for several years, I would regularly attend the Dane County Farmer’s Market, the largest producer-only farmer’s market in the country. Every Saturday morning during the warm season, the entire capital square would be filled with vendors, selling fresh produce, flowers, baked goods, and, of course, because this is Wisconsin, cheese and meat. Each Saturday, between 9 A.M. and noon, crowds of people pack the sidewalks that surround the capitol square, creating a lively scene. It was enough volume, enough activity, that every other farmer’s market I visited after this one has left me asking “Is this it”? That is partially because the Dane County Farmers Market is a unique experience in a unique place. It was included as a “must see” in the book 1,000 Places to See in the USA & Canada Before You Die. The book, however, was published in 2007, and a lot has changed since then. One distinct characteristic of the 21st century is the presence of simultaneous contradictory trends. For example, we have a new generation of people emerging who both spend over nine hours per day in front of screens and prefer face-to-face interactions. Likewise, while obesity rates continue to climb, people are also becoming more health conscious and more aware of the food they consume. Specifically, with detox diets, and awareness of the amount of waste caused by our food distribution system, more and more people are desiring locally sourced food. This can be seen at grocery stores and even some restaurants, where more and more displays indicate that food was produced on a “local” farm. Farmers markets are expanding everywhere to meet this increasing demand to buy locally produced preservative free produce. Some lists of top farmers markets in the USA published more recently do not even include the Dane County Farmers Market. The Dane County Farmers Market still certainly represents a unique experience, as it has always been about more than just the vendors. As far as I can remember, Madison has always been a very political town. On all four corners of the square, booths promoting political causes and local candidates are an expected presence. Along the roads that radiate outward from the Capitol Square, more interesting activity can be found, including live performances, some additional vendors and demonstrations of activities like wood carving, and even an impromptu children’s play area placed in front of the children’s museum. I would say that Madison, Wisconsin is certainly more interesting than most towns around this size. 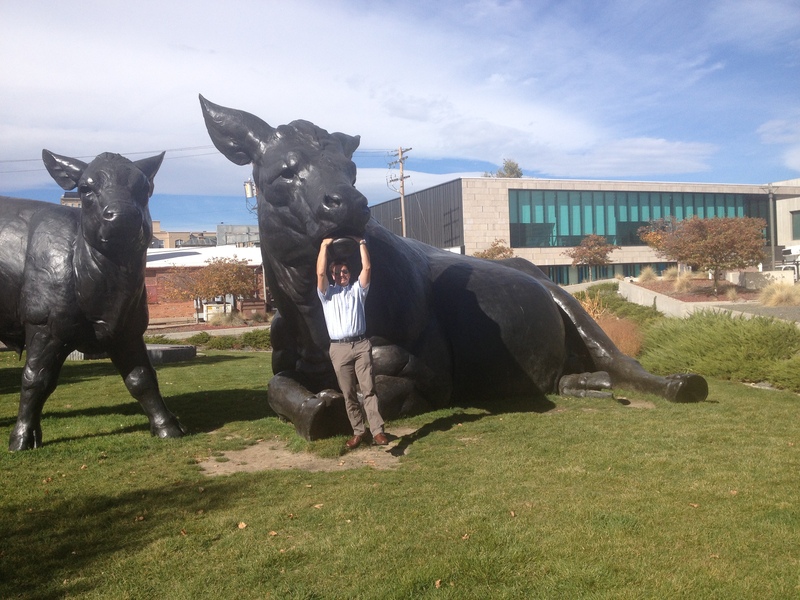 The college campus guarantees plenty of interesting cultural activities. The pedestrian mall, State Street, that connects the capitol with campus is always active, even if it does have a speed limit that just begs people to break it… on their bicycles. And there are the lakes, four of them to be exact, of pretty good size, one of which is directly adjacent to the University. The city has two other characteristics that, having visited a lot of different places, feel quite surprising. One is how strong drinks are mixed here, particularly on State Street. I ordered a make-your-own-bloody mary at one of the many establishments on State Street. Restaurants that offer this beverage typically provide a glass with vodka to mix with the other ingredients at the bloody mary bar. This is the only place where the glass provided to me was filled halfway up! Mixed drinks at other bars are also quite strong compared to the ones in most other cities. From a now outsider perspective, it is also surprising to see how politically one-sided Madison is. Signs promoting events and groups, conversations around town and even signs in front of local businesses are quite frequently politically charged, way more so than in most other cities and towns. They are all from one side. It is as if those on the other side had been silenced or run out of town. In a State that is quite close to evenly divided politically, it feels strange to be in a place where one side has near 100% dominance of the discussion. Sometimes I find it depressingly easy for people who live in cities to forget what region they are in, on a larger scale. Traveling around the country, it often feels like all cities are tying to build the exact same amenities as each other; luxury apartments, shared workspaces, microbreweries, and art galleries. In my current hometown of Denver there is a constant reminder of where we are, the mountains to the West which tower over the skyscrapers of the city. The Midwest does not have that, however, seeing booth after booth selling cheese curds, other agricultural products, and products like venison jerky is as clear of a reminder to any that Madison is part of Wisconsin, which is part of the Midwest. This entry was posted in cities, culture, events, food, politics, Wisconsin and tagged Farmers Market, Madison, Midwest, travel, Wisconsin on June 19, 2018 by Stephen Jaye. 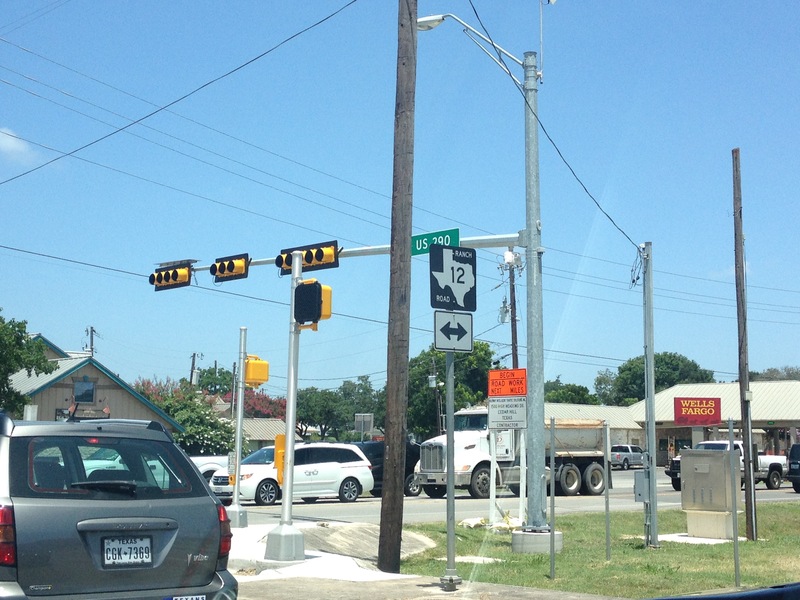 In my last post, I describe my experiences visiting the City of Austin, Texas. 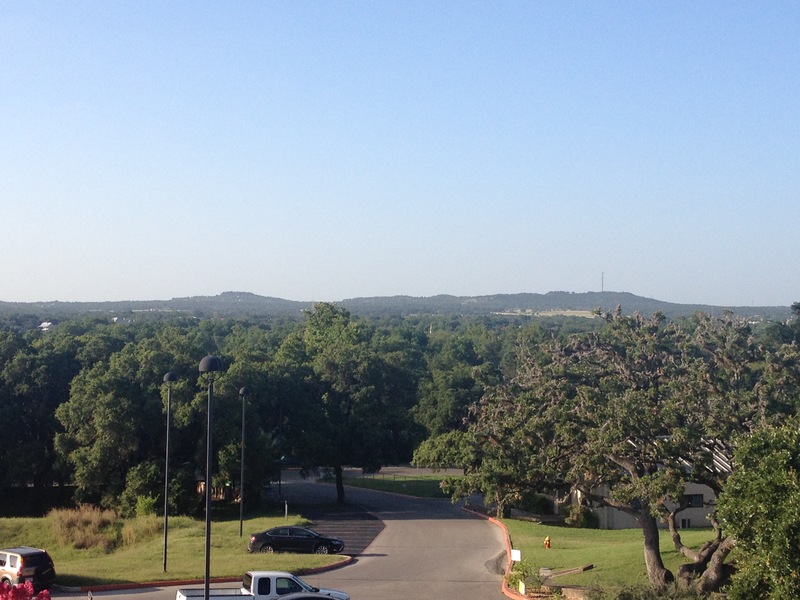 Some people describe Austin as being “not really Texas”. And, while that may be a simplification, or exaggeration of the experience there, the general point is that the experience of being in Austin is different than the the experience of being in any other part of Texas. So, while I spent some time in Austin last weekend, I also got the opportunity to experience other places in Texas, and actually get immersed into the culture here. 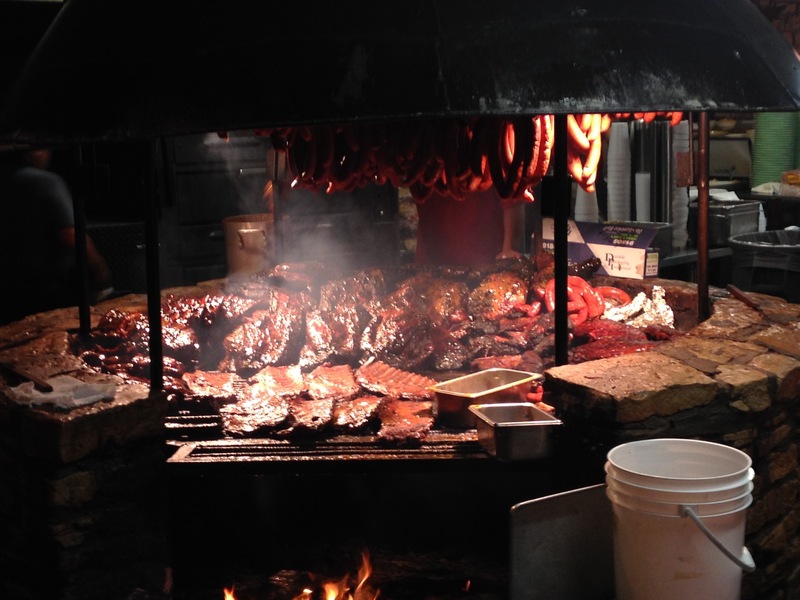 One of the first places I went to, just 20 miles or so outside of Austin, was the Salt Lick, for some high quality Texas barbecue. I was surprised to see such a large establishment. I had gone to BBQ in places like Oklahoma City and Tulsa in the past, and those experiences usually involved smaller, more side-of-the road type establishments. 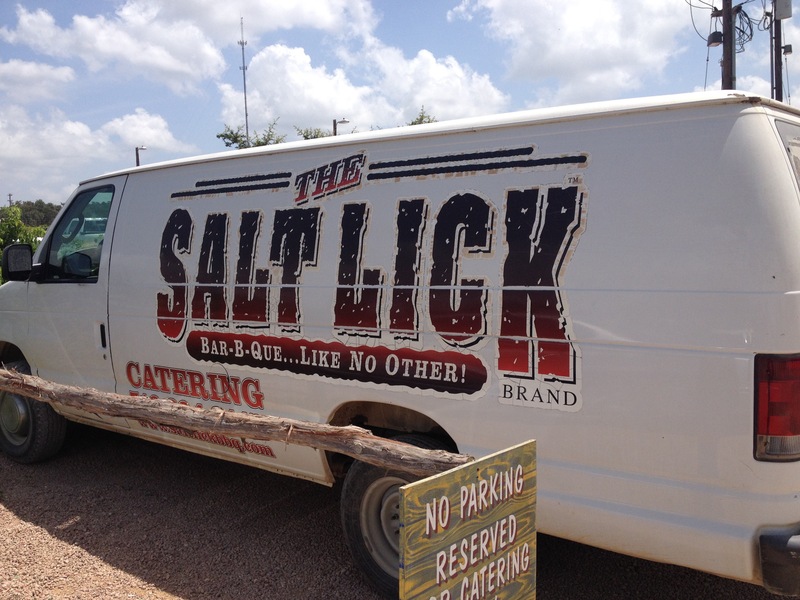 I had come to, in my head, assume that was the standard BBQ experience, but the Salt Lick is pretty gigantic. And, the first thing I saw when I entered the restaurant was a gigantic barbecue pit. The last time I had seen so much meat in one place was at the World’s Largest Brat Festival in Wisconsin. Texas style barbecue, of course, includes brisket. In order to experience the full range of barbecue experience, I ordered a combination plate that included brisket, ribs, and sausage. I was pleasantly surprised to find that the restaurant asks their patrons if they want their brisket “lean”, or “moist”. Not being a fan of fatty meats, I chose “lean”, and really enjoyed the entire meal. In fact, I kind of felt like I spent the entire weekend eating brisket! 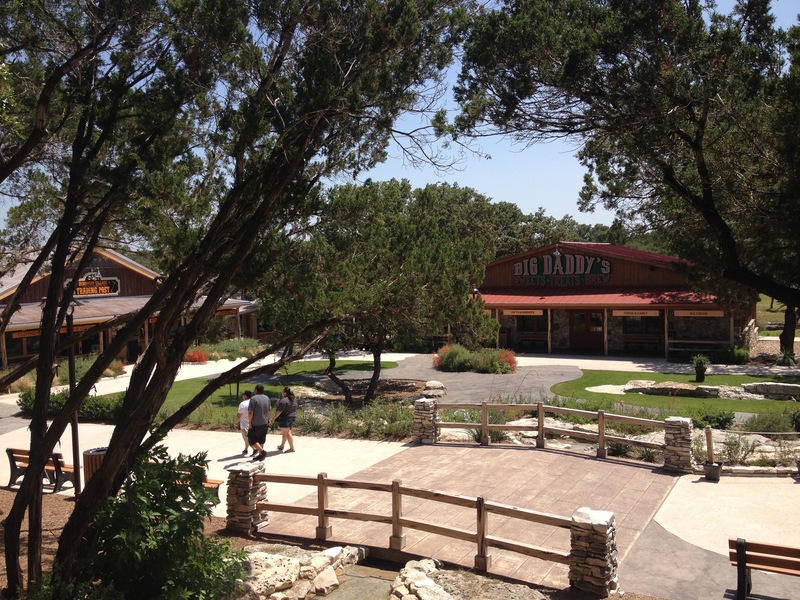 The other establishments I went to, like the Salt Lick, were sizable establishments. 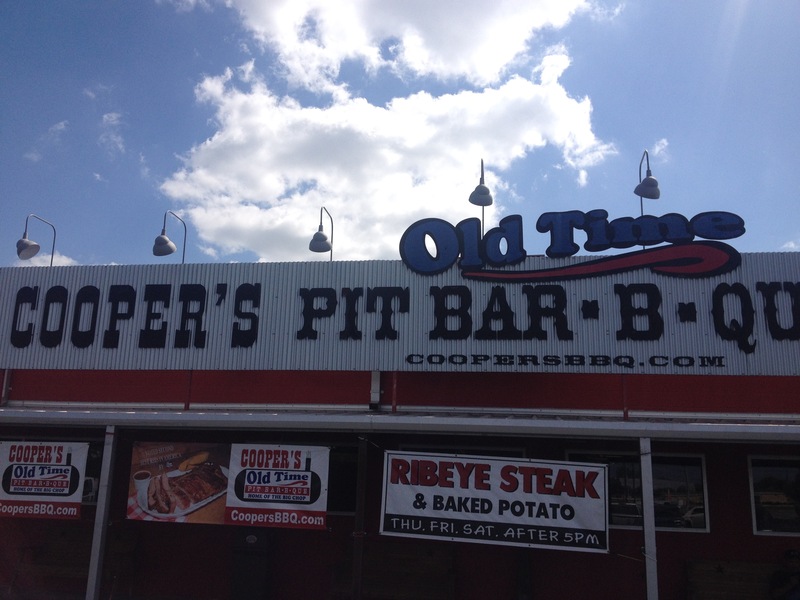 Coopers, in New Braunfels, was big enough to accommodate a group of 16 people without really having to adjust anything from their normal operating experience. Whenever I was not eating barbecue food, I was eating Mexican food, which is plentiful in Texas due to it’s close proximity to, as well as history of being a part of, Mexico. 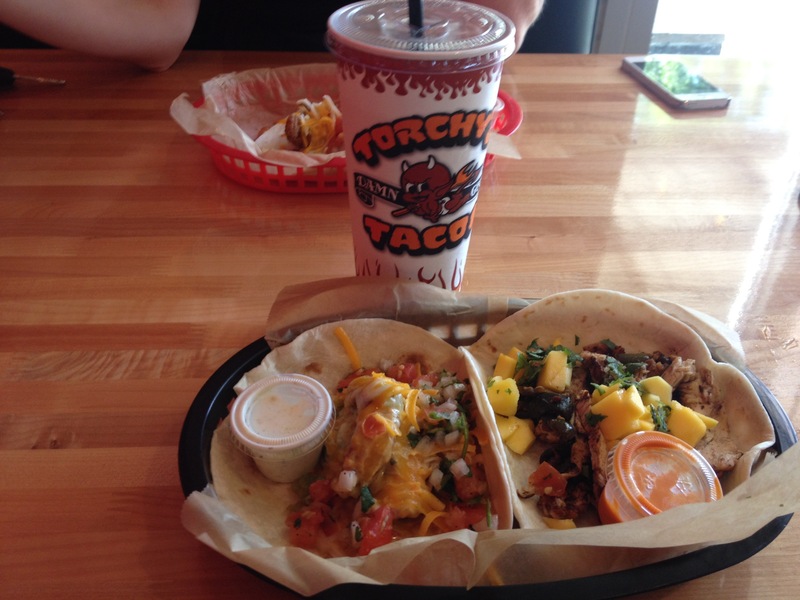 I visited several Mexican food establishments while in Texas, including a place many of us that live elsewhere should become familiar with: Torchy’s Tacos. Later this year, they will expand beyond the borders of Texas, opening up a location in Denver, Colorado. They may very well expand to some other areas as well. In Bourne and New Braunfels (and places between), I got to experience a bit of the local culture. 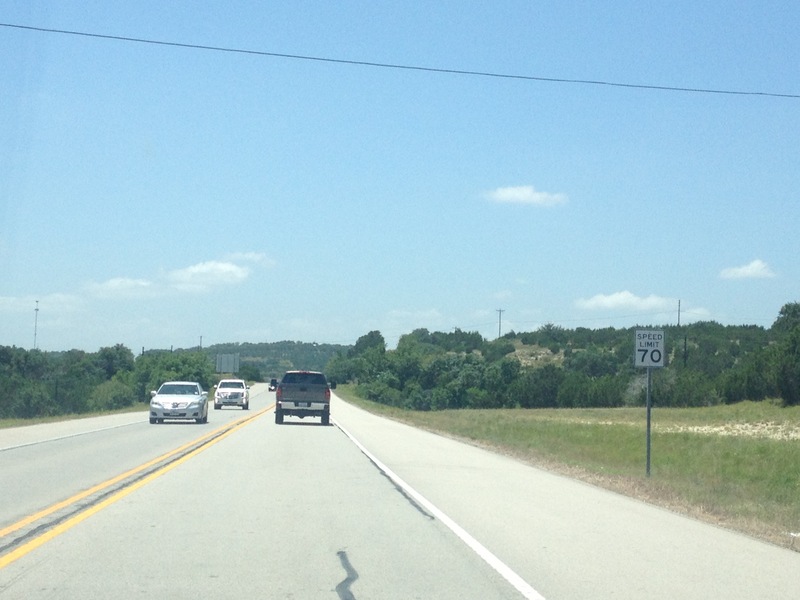 This area is often referred to as “Texas Hill Country”, as, well, unlike most of the Great Plains, it is kind of hilly. Parts of it sort of remind me of the “Driftless Area” of Southwestern Wisconsin, with rolling hills one to several hundred feet tall. Although, the geological history these regions is quite different. Here I attended a wedding, and took part in another local custom, floating the river. At the wedding, the main thing I noticed about the culture here in Texas was the affinity for line dancing. I had expected the country music line dancing. But, what shocked me was how often people would just naturally form a line while dancing to other songs. When YMCA, and Gangnam Style, came on, people here just naturally formed themselves into a line as if it were second nature. 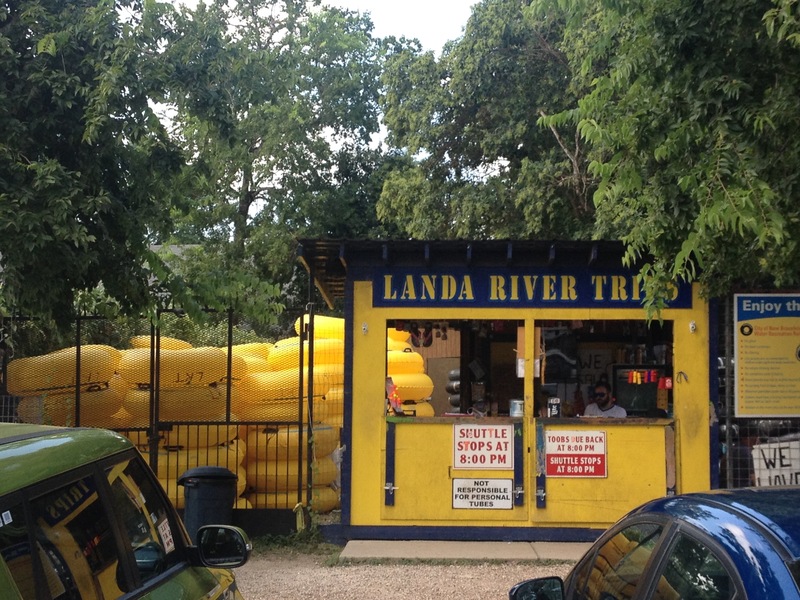 In Texas, if is quite common for people to go on “floating”, or “tubing” trips. 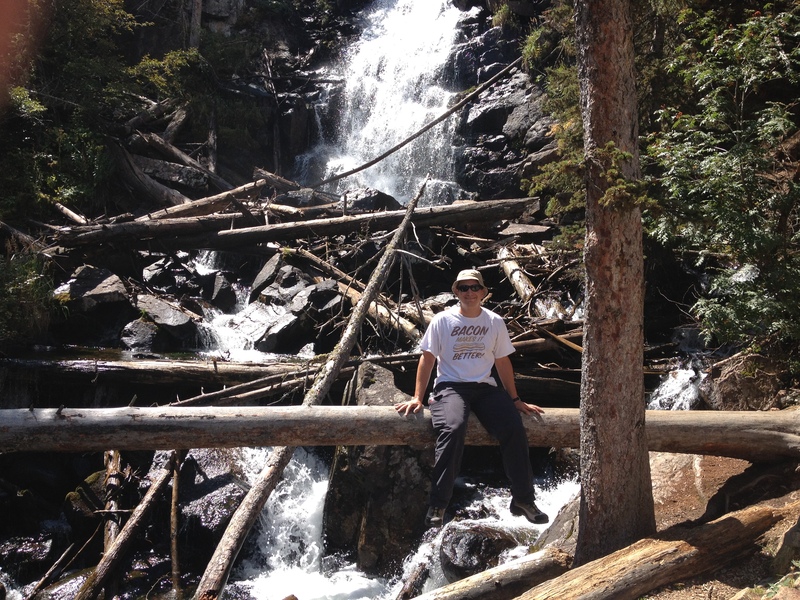 It is basically an outdoorsy activity that is far more relaxing than the ones I usually take part in here in Colorado. It mostly just involves laying in a tube, and gently floating down a river. Many people here own their own tubes to float in, and bring floatable coolers, where they pack beer. I have heard it is quite common for people to get quite intoxicated while taking part in a float trip. 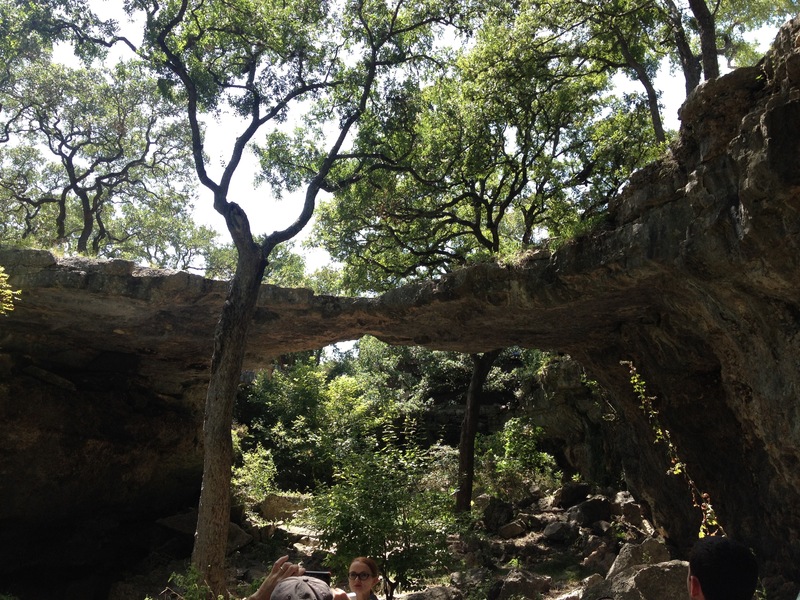 Texas hill country also contains a lot of natural features, some of which have become common family-type tourist destinations. 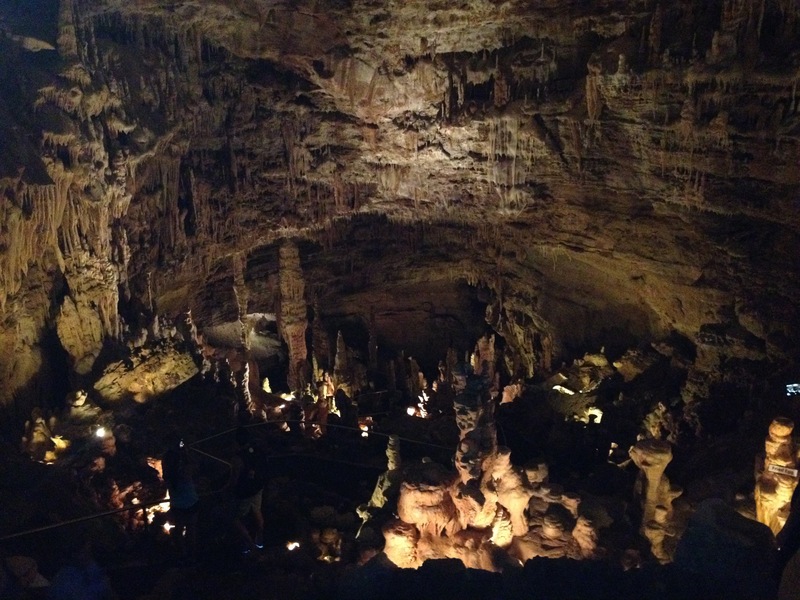 A few miles west of New Braunfels is a place called Natural Bridge Caverns, which, just as the name advertises, is a Natural Bridge above ground with a cavern below ground. Every time I visit a place like this, I always come away with mixed views regarding the commercialization of these natural features. One one hand, I look at staircases, buildings, and all of these artificial looking features being present, and wonder if we are losing out on some of the experience. 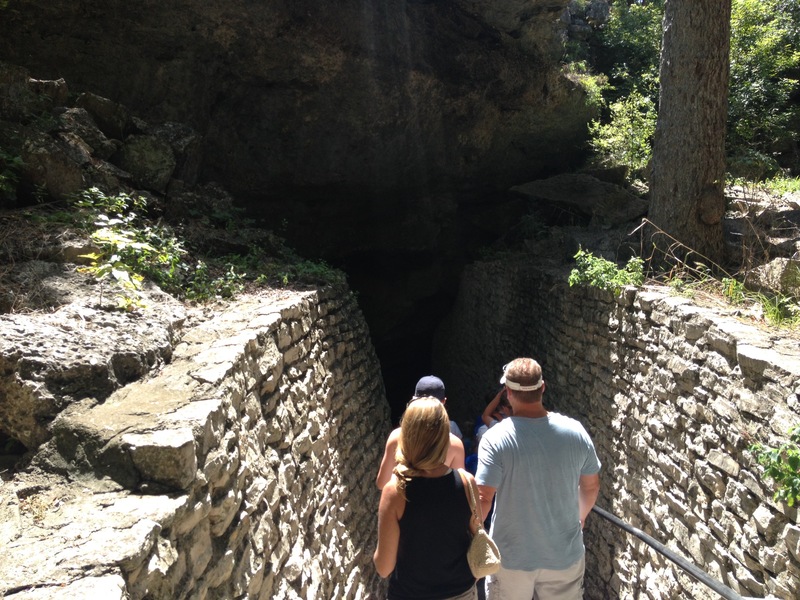 But, I also see that having paved roads to get here, walkways through the area, and other comfort related conveniences opens up the experience of viewing these places to many people who otherwise would not have been able to see them. 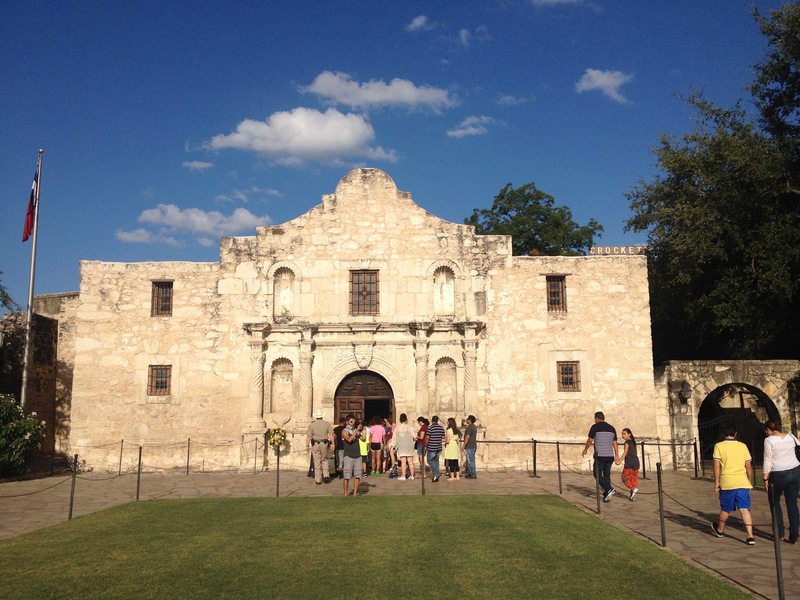 It was in San Antonio, however, where I learned about the history of Texas. Downtown San Antonio kind of has an odd combination of historical significance. On one end of downtown is The Alamo. Originally a “mission“, the place later became a military post in the war for independence from Mexico, and now a museum, which is also considered a Shrine of Texas Liberty. This place very much celebrates the people of Texas separating from Mexico, and, of course, later joining the United States. 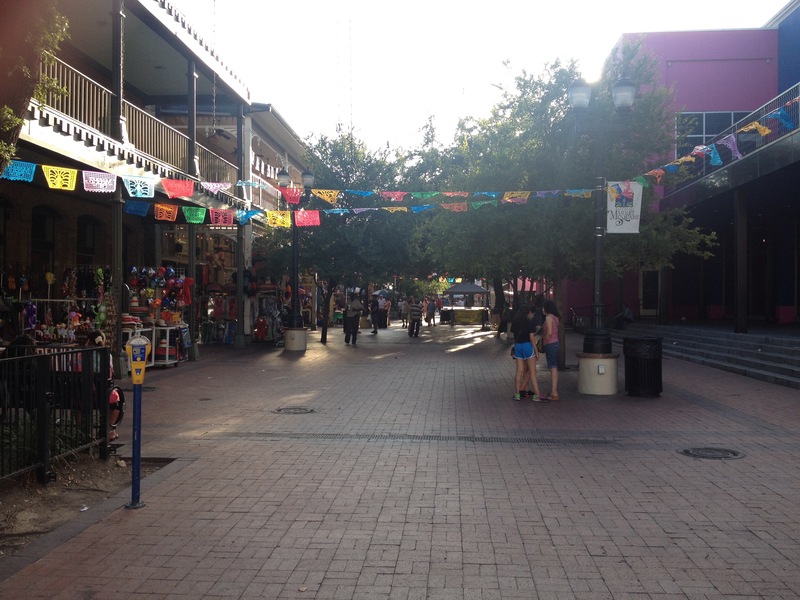 On the other end of downtown is a place called Historic Market Square, a place that celebrates Mexican cultural heritage. In the plaza, I saw T-Shirts for sale that exuded Mexican pride. In fact, with authentic Mexican food and cultural items for sale everywhere, I almost felt like I could have actually been in Mexico. It just makes me wonder. Is this a City that is in conflict with itself? How do those of Mexican decent here in San Antonio feel about Texas history? The area between the Alamo and Historic Market Square was also kind of confusing. On the surface, the city looked kind of dreary. I kind of felt like I was in a bad part of Chicago, or any other big city that has a significant amount of blight. 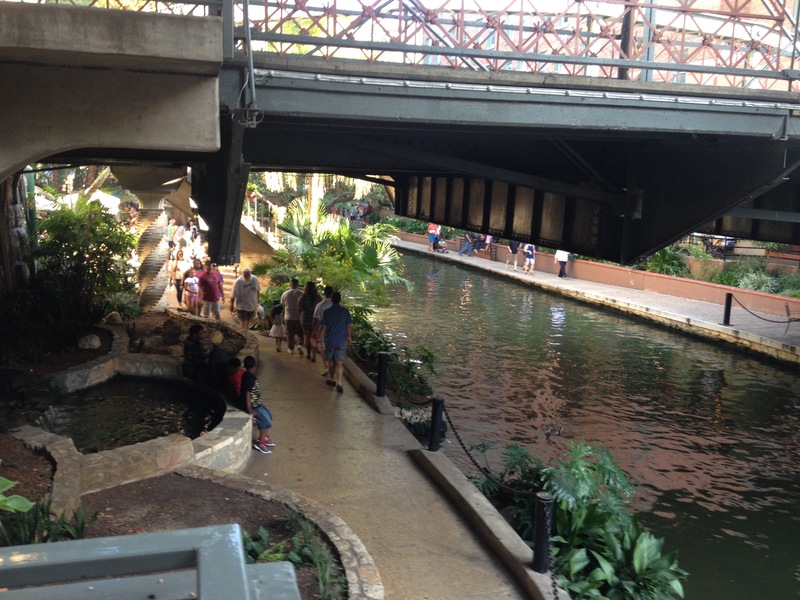 But, underneath the surface was San Antonio’s Riverwalk, which is quite lively. 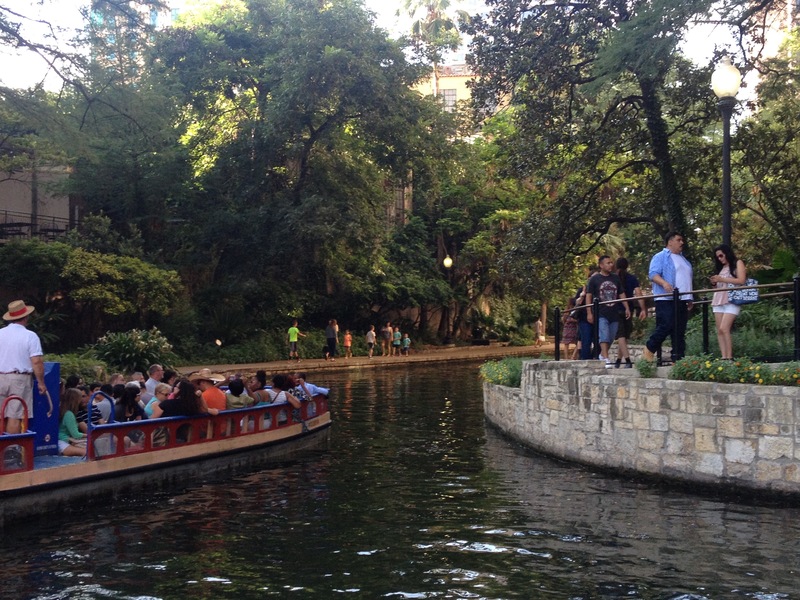 In fact, San Antonio kind of pioneered the idea of riverwalks. And, it appears other cities are trying to copy them. After reading about Texas history, I kind of had a better understanding of the place. Specifically, at the Alamo, they describe a struggle in Mexican politics. On one side there was a group of people that strongly supported a Federalist type system of government based on a constitution that was modeled after the United States. Under this system, some powers were devolved to the states, of which Texas (or Tejas) was one. On the other side, was a group of centralizers that wanted more control in the hands of the central government in Mexico City. Texans strongly supported the former over the latter, and when the latter won power, they felt their way of life threatened. 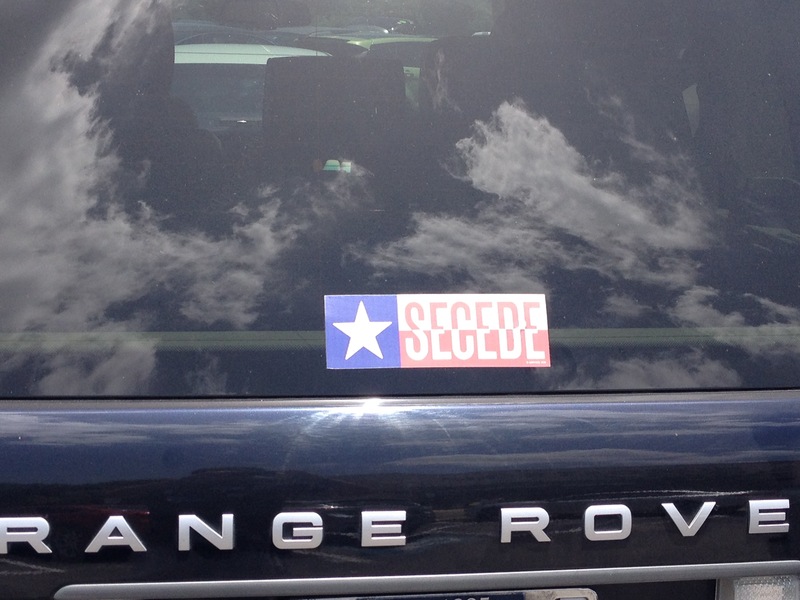 The successful defense of Texas, establishment of the Lone Star Republic, and later admission to a country whose values more closely resembled their own is viewed as a triumph. It is without a doubt that many Texans today see a lot of parallels (whether or not they are correct) to today’s political struggles in the United States. Having this history, one in which many people in the state take pride, definitely explains why succession talk would be much more prevalent here than it would be in other states who strongly oppose some aspects of how our Federal government is operating. There was always some concern over whether I would fit in here in Texas. Anyone that talks to me can clearly hear my Long Island accent. I do not try to hide it. Some people who have lived in Texas told me that it would also be obvious that I am an outsider by the manner in which I conduct myself, and the types of topics I discuss on a regular basis. But, I took a “leap of faith” of sorts, and just decided to be myself when interacting with people here. And, I was actually received quite warmly here, by people who probably have a significantly different lifestyle and set of values than my own. Everyone was friendly to me, and they were even receptive to the kinds of conversation topics I tend to engage people in. As I thought through the acceptance I experienced here, as well as the history, the current succession talk and anger, I came to an important realization. Maybe we are not nearly as divided as people make us out to be. Maybe it is really only the most vocal (and angry) among us that display this division. After all, if 1.4 Million people can live in a city which celebrates both it’s Mexican heritage and it’s struggle for independence from Mexico, maybe we can find a way to celebrate what makes everyone unique. 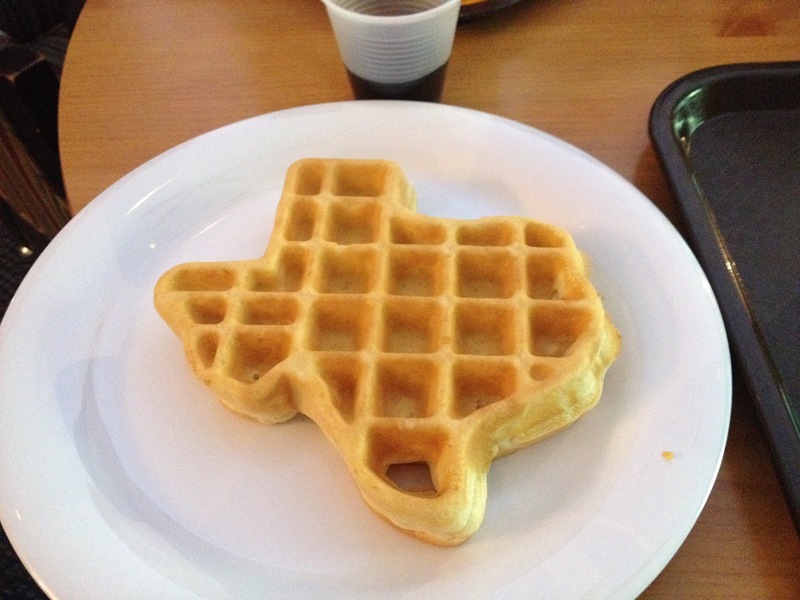 This entry was posted in food, local culture, politics, Texas, Unique Natural Features and tagged alamo, barbecue, culture, politics, San Antonio, Texas, Texas Hill Country, Texas history, Unique Natural Features on July 18, 2015 by Stephen Jaye. What is the current state of your location? What are the trends? What do people like to do? What makes your particular location unique? What are people talking about? What are people concerned about? What are the hopes and fears for the future? These are amongst the questions often answered through travel. Sometimes, even when a traveler has nothing of this nature on his or her mind, answers to questions like these present themselves. This is why I have thoroughly enjoyed all of the travel related shows hosted by Anthony Bourdain. In each and every show he has been involved in, he travels to various locations with the simple goal of getting a comprehensive sample of a particular region’s food. However, in nearly every show, he strikes up conversations with people local to the area, and learns quite a lot about their culture, history, and expectations. Colorado has been on a lot of people’s minds lately. Most surveys rank it one of the top 5 (or at the very least in the top 10) fastest growing states in the country. Most of this population growth has come from migration of people from elsewhere in the country. 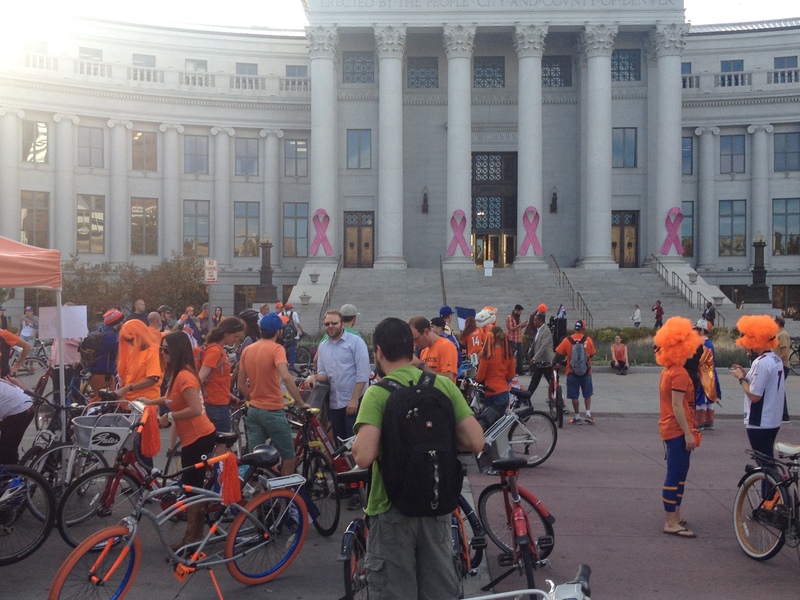 Colorado has also drawn significant national attention for a variety of reasons this year. Recently, football fans at Sports Authority Field got to witness quarterback Peyton Manning break the all time record for career touchdowns. This year, Colorado became the first state in the nation legalize the sale of recreational marijuana. And, the city of Denver was recently ranked the 4th most influential city in the country, according to a survey of mayors. 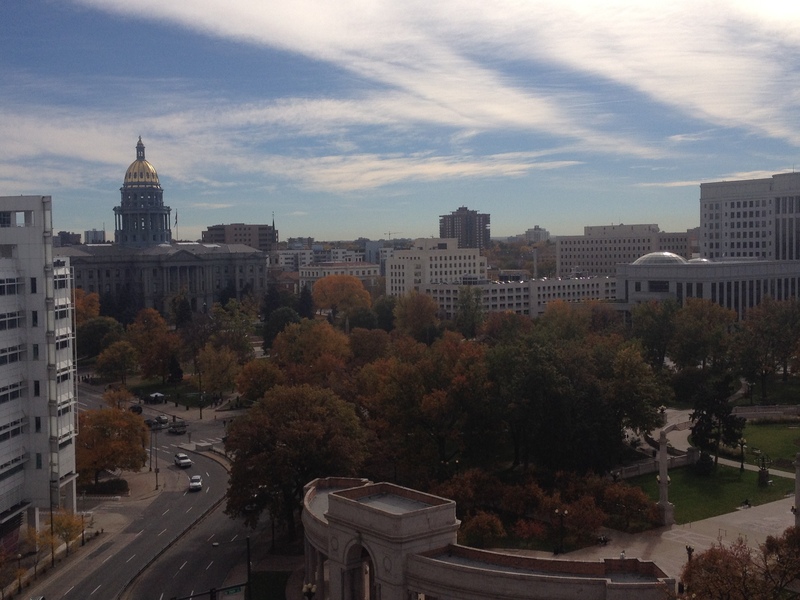 With this being the autumn of an election year, and Colorado being a closely contested state (a “swing state”), much of the recent national media attention has turned to Colorado, and our two closely contested elections. As the story goes, in two weeks, two very important elections are about to take place; one that will determine the direction the State of Colorado takes in the coming years (Gubernatorial), and one that may determine the direction the whole nation takes in the coming years (Senatorial). Living in the Capitol City of such as state, one would expect these two important contests, and the political implications of them to garner a significant amount of intensity and enthusiasm. However, if I had a dollar for every time someone asked me who I was planning to vote for in either election, I would be not a cent richer than I currently am. By contrast, if I had a dollar for every time I was inquired about the other all important state question, whether I was getting the Epic Pass or the Rocky Mountain Super Pass, I would probably accumulate enough money for an amazing night out. While this could be just the people I happened to associate with here in Colorado, or the types of conversations I tend to pursue, a walk through my neighborhood reveals significantly less yard signs than in most election years. What I do see throughout my neighborhood, as well as most areas nearby, including downtown, are fliers like this one everywhere, sometimes multiple fliers per block, attempting to get people to inquire about campaign jobs for the coming election. Nearly every one of them appears exactly as this one does ,with close to all of the tabs underneath the flier remaining un-pulled. 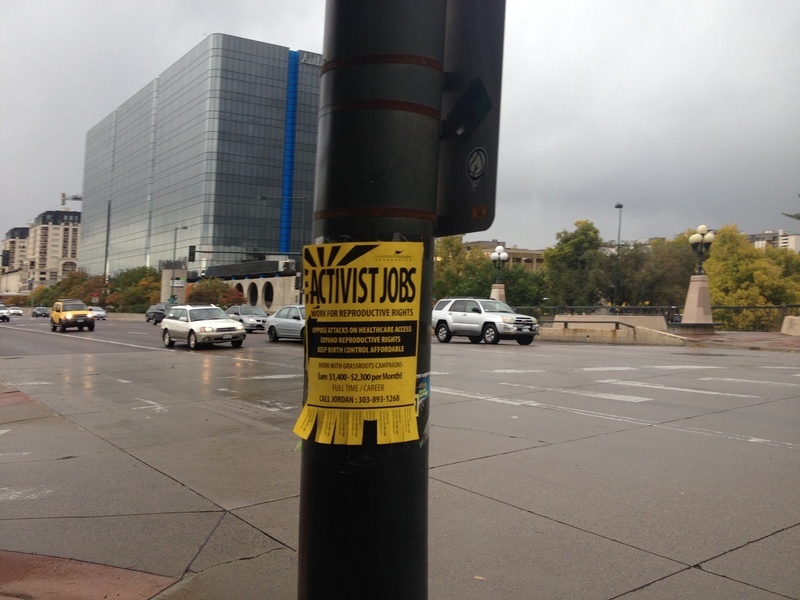 In fact, this past Wednesday evening, after a networking event, I returned to my bicycle to find a similar flier had been wedged into my brake lever; something I had never expected to see, but also something that demonstrates to me campaigns are actually having a hard time getting some of these paid positions filled. 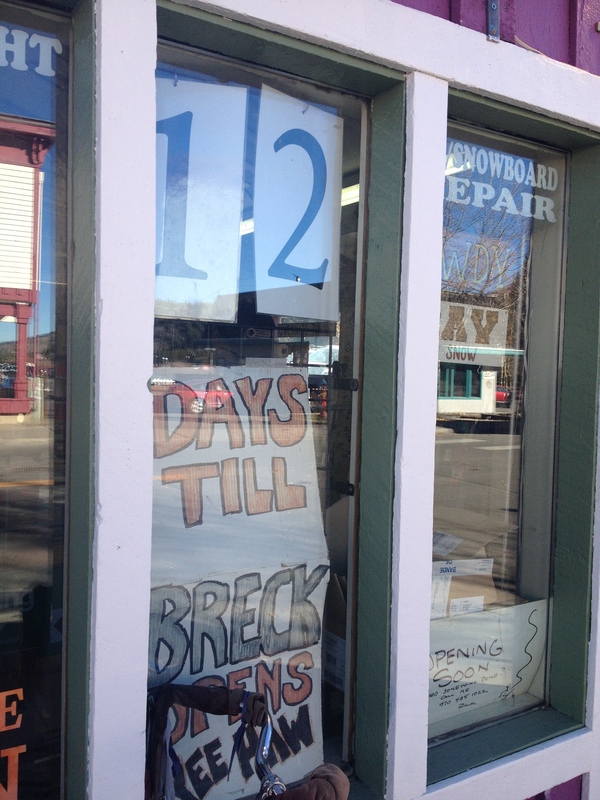 All of this tells me that Coloradans have other things on their mind. 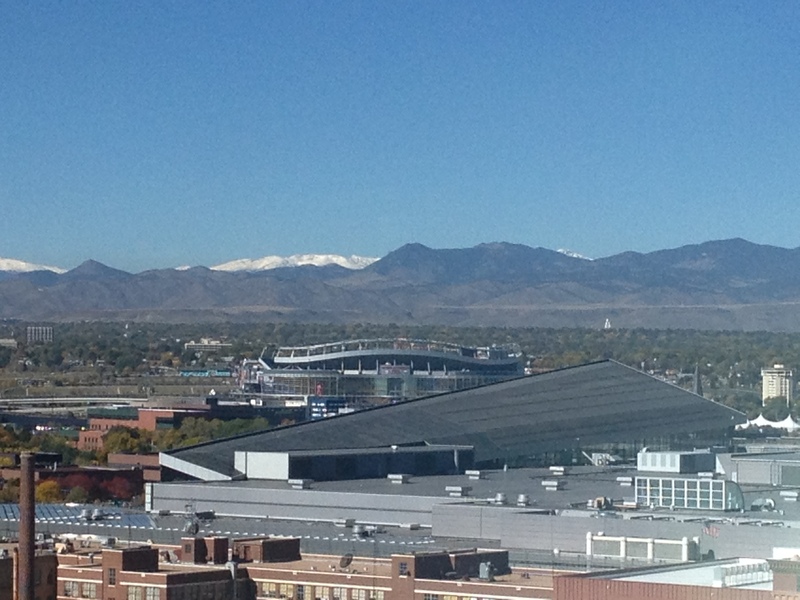 There is a significant of excitement around the Denver Broncos, by far Colorado’s most cherished sports team. 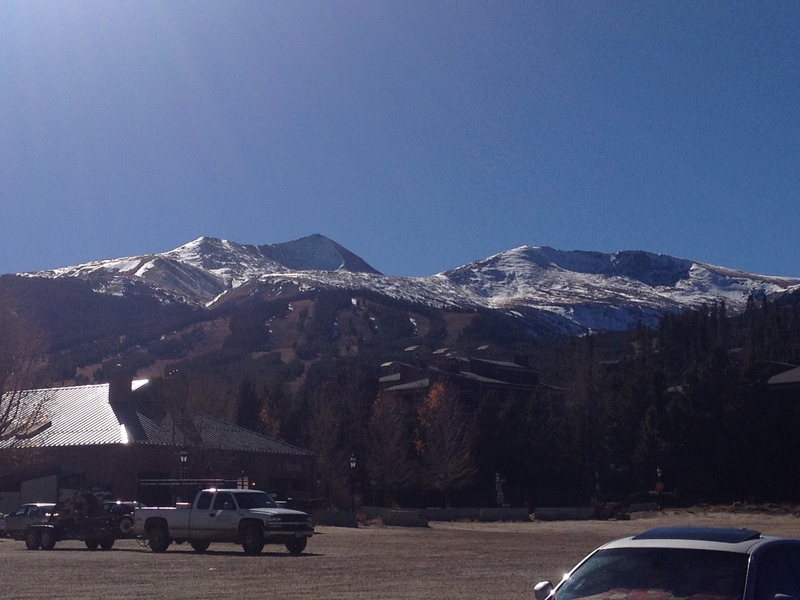 And, while this October has featured some beautiful weather, and some amazing fall colors that are atypical of this areas, many are concerned that this may delay the opening of ski season. 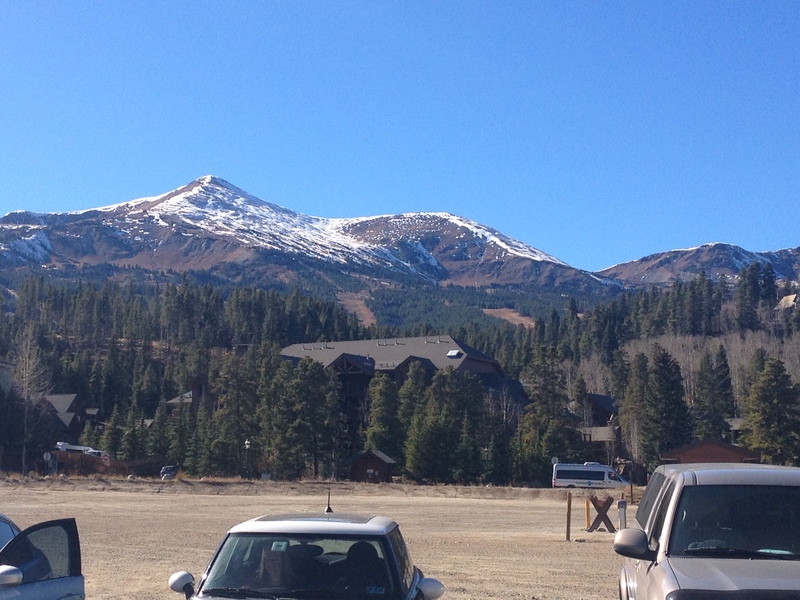 Most of the ski trails remain snow-free. And, of course, people are quite divided regarding the rapid growth of the region. Some cherish the opportunity to become the next significant and influential mega-region, with all of the privileges and responsibilities that it brings, while others lament the changes that are making the place significantly different than it was just a mere half a decade ago. So, which is it? 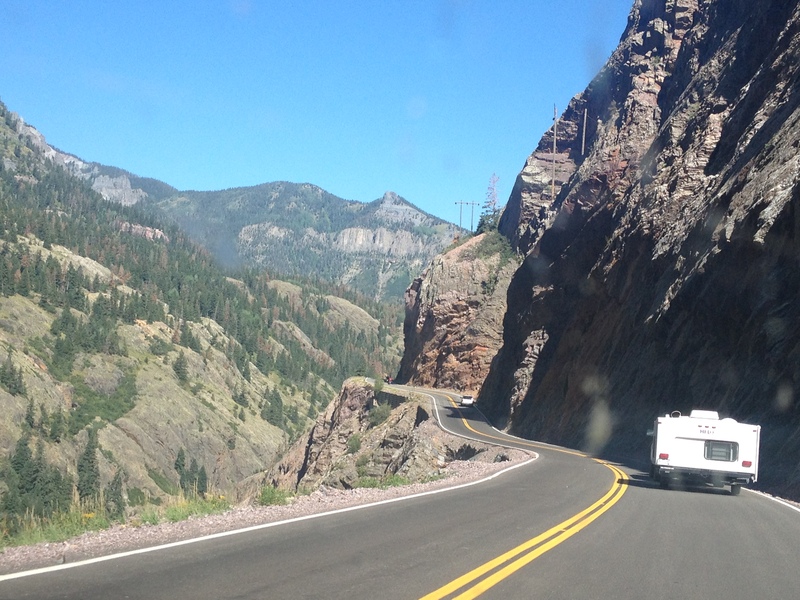 Is Colorado, with its high density of start-ups, leadership in the craft brewing movement, and unique way of life, the place where trail-blazers grab the bull by the horn and reshape the world? Or is it still a place largely isolated from the population centers and mega regions, where people go to explore the world on their own, and escape as many outside influences as possible? Or, more importantly for the future, can we find a way to be both? 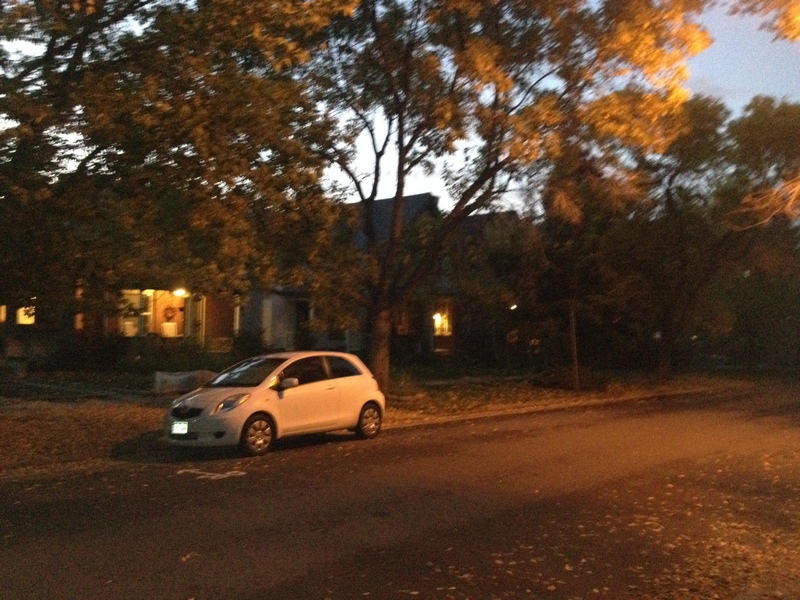 This entry was posted in cities, Colorado, culture, politics, sociology, transitioning places and tagged Colorado, Colorado trends, Colorado's future, local culture on October 26, 2014 by Stephen Jaye. Anne Arundel County is my favorite county in Maryland. It sits on the western shore of the Chesapeake Bay, south of Baltimore (and Baltimore County), and east of the counties in the D.C. area. Many people are surprised that I have a favorite county in Maryland. 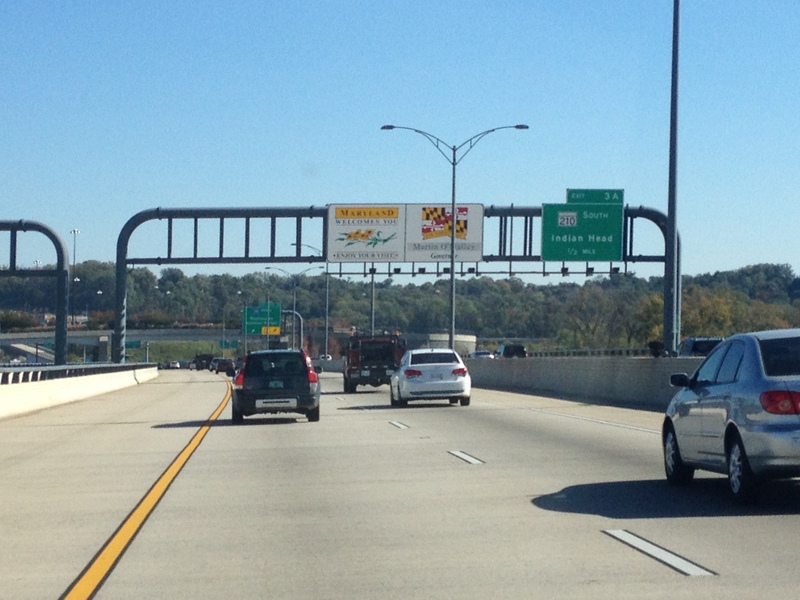 But, I feel like Anne Arundel County provides visitors with an experience that seems quintessentially Maryland to me. It’s primary city, Annapolis, is characterized by the colonial development style that makes these early colonies on the eastern seaboard distinct from much of the rest of the nation. However, much of the rest of the county is suburban in nature, which is really what much of the populated part of Maryland is like today. 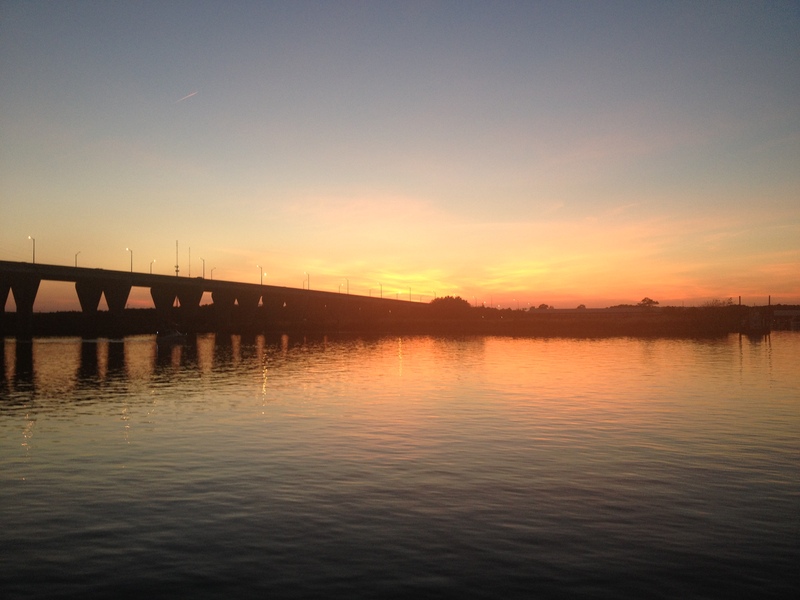 With it containing a shoreline on the western banks of the Chesapeake, many of the boating activities synonymous with Maryland culture have a significant presence in this county. In my experience here, which is quite extensive, as I have an Aunt and Uncle who used to live here, and good friends that still do (whom I am visiting this weekend), it seems as though this part of Maryland is not as politically charged as the counties to the west, adjacent to D.C. Those areas actually feel more like an extension of D.C. than really Maryland, the same way Arlington and Alexandria seem more like a D.C. extension than Virginia. Both of these areas are significantly different culturally from the rest of their respective states, and therefore a visit to Silver Spring is no more of a “Maryland experience” than a visit to Arlington is a “Virginia experience”. I have some amount of destain for politics and politicians at this time. It is not that politics is not an interesting topic of conversation and not significant. It is just that the way we practice and discuss politics in this nation at this time has this strange way of bringing out the worst in people. Right now, I view Washington D.C. as a group of people who generally view themselves as way more important than they are/ should be, and therefore I had no desire to pass through this city at this time. 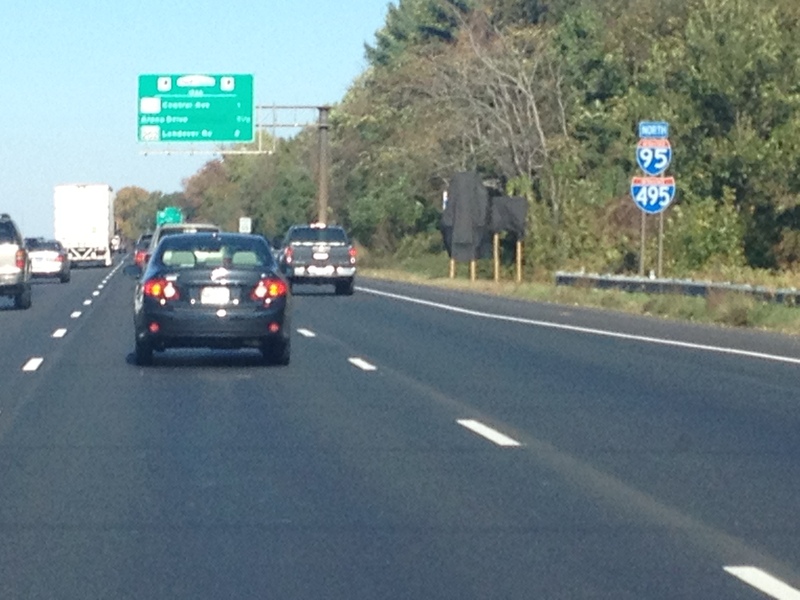 So, I went around on the “beltway” to get to Anne Arundel County. 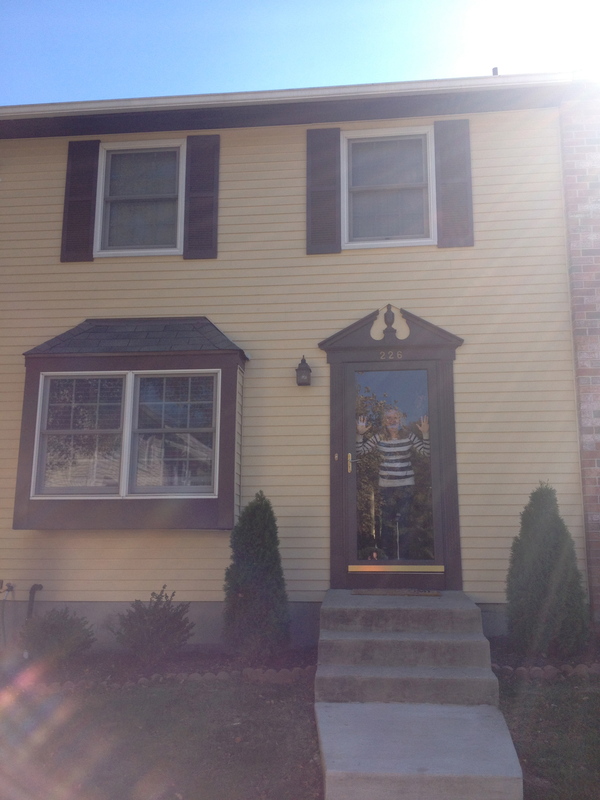 My friends live in a row house in Millersville, MD. The section of houses they live in is not too uncommon for this part of the country. It is crowded and the houses actually connect to one another. Saturday was a housewarming party, and my contribution was a bottle of Bourbon I had picked up on the Bourbon Trail in Kentucky on Wednesday. 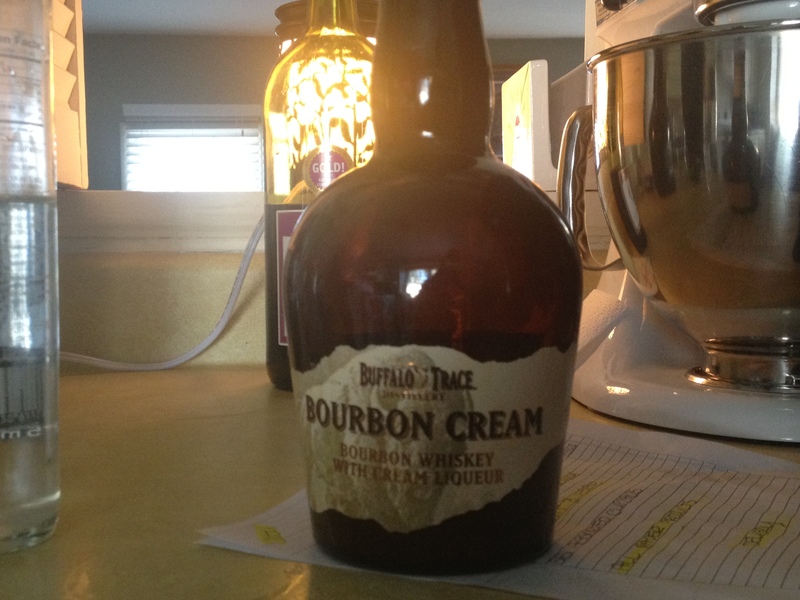 It is Bourbon Cream from Buffalo Trace. It tastes like Bailey’s, only better. It went over well at the party, and I would recommend it! On Sunday we took a drive over the Bay Bridge over the Chesapeake Bay to an area referred to as Maryland’s “Eastern Shore”. The Bay Bridge is a really neat bridge. It is a classic for those that love bridges. The main marvel of engineering on this bridge is how long the bridge is, 4.3 miles. It is a testament to the amazing engineers that we have in this country that I, along with millions of drivers each year, cross this bridge, over 150 feet above the water’s surface for this long of a span of time and distance without feeling nervous about the integrity of the bridge. I think more people complain about the toll than anything. Traveling through Maryland’s eastern shore, first on U.S. 301, then on state route 300, I am quite surprised by the scenery I encounter. 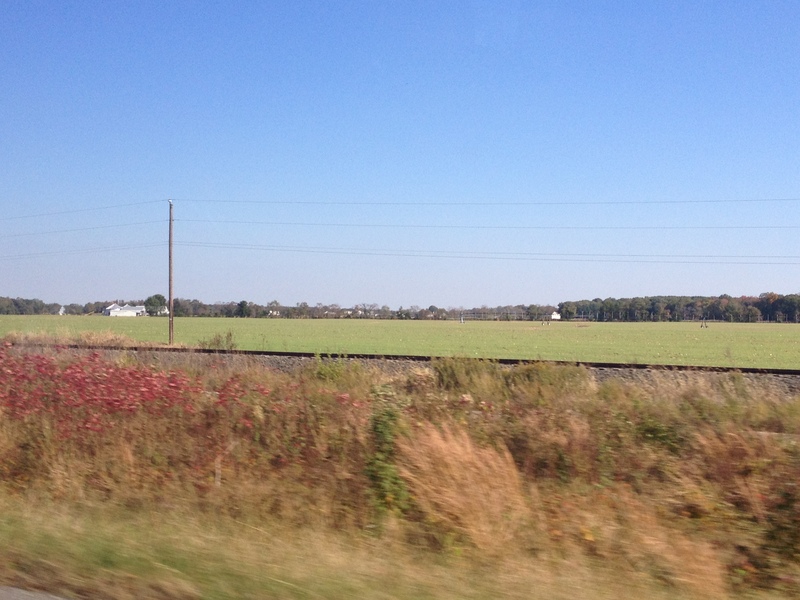 After the first few miles off the bridge, where the same shoreline features that are common in Anne Arundel County seem prevalent, I actually encounter farmland that reminds me of the midwest a bit. Not as many trees have been leveled here to make way for farmland as have been in northern and central Illinois, and the trees are a bit denser in the non leveled places. But, many of the crops are the same. And, I surprisingly encounter some irrigation devices too. 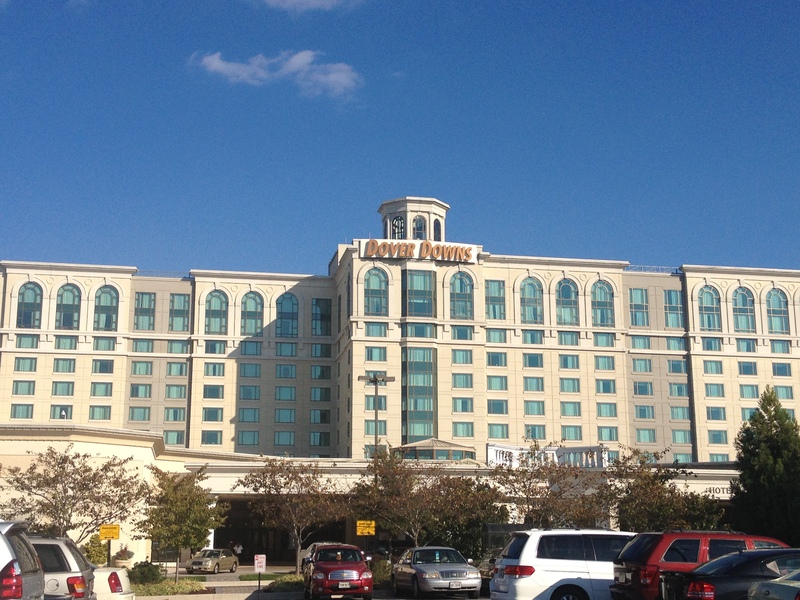 Our destination is Dover Downs, a “racino” (which refers to a racetrack that is also a casino). Unlike many of the other racinos I have been to, this particular one has both a horse racing track and a NASCAR track. 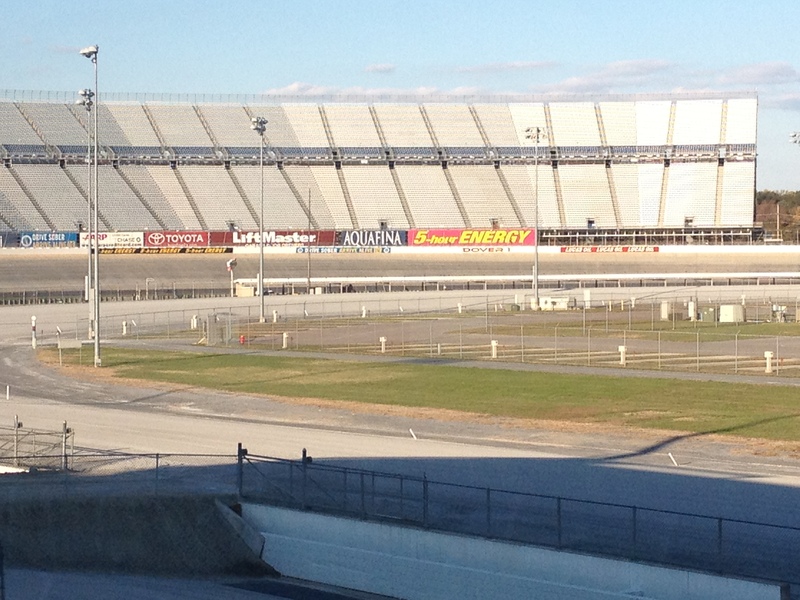 NASCAR hosts a couple of races here each year. I headed into the club box, where all of the rich people would sit during these races, as well as their horse races, which occur more frequently. But, there were no races, for cars or horses, today. The other thing that differentiates this place from other racinos I have been to is that the casino part of the facility is a full casino, and offers you a casino experience equivalent to visiting a standard casino. By this I mean that every table game, from the common black jack and craps, to games like pai gow poker, can be found here. Also, there are no alternate rules that change the experience, such as no alcohol sales or the requirement of a “rake” at the black jack tables. At Canterbury Park in Minnesota, for example, every $10 black jack bet requires the player to chip in a 50 cent “rake” that the casino just takes. This makes it nearly impossible to win, and not a great place to gamble. No such restriction exists at Dover Downs, and I appreciate that. 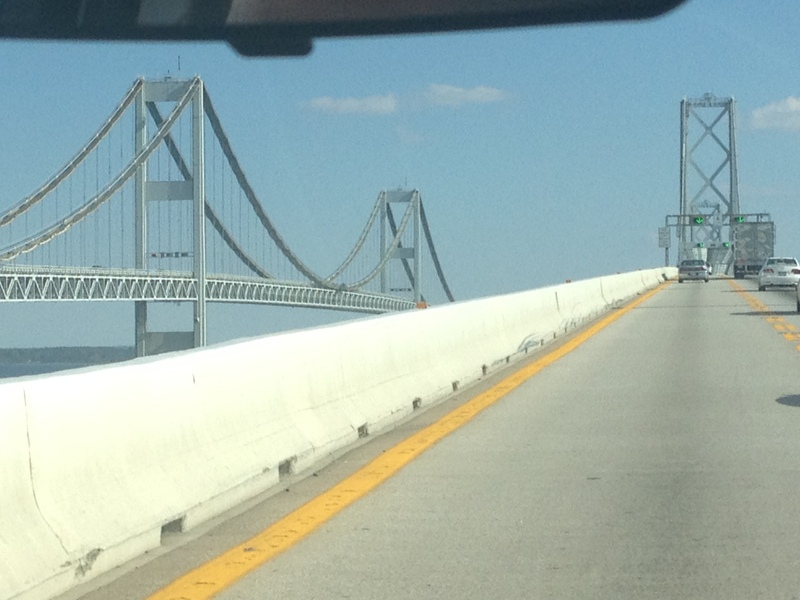 After the racino, we head back into Maryland, but not quite back over the Bay Bridge. This was so that I could take part in an activity that I have always closely associated with Maryland; eating crab. In fact, I can barely remember the last time I came to Maryland without going out for crab. There is really nothing like eating seafood when it is fresh, and being that I currently live in land-locked Colorado, it was imperative that I have a seafood meal while in Maryland. 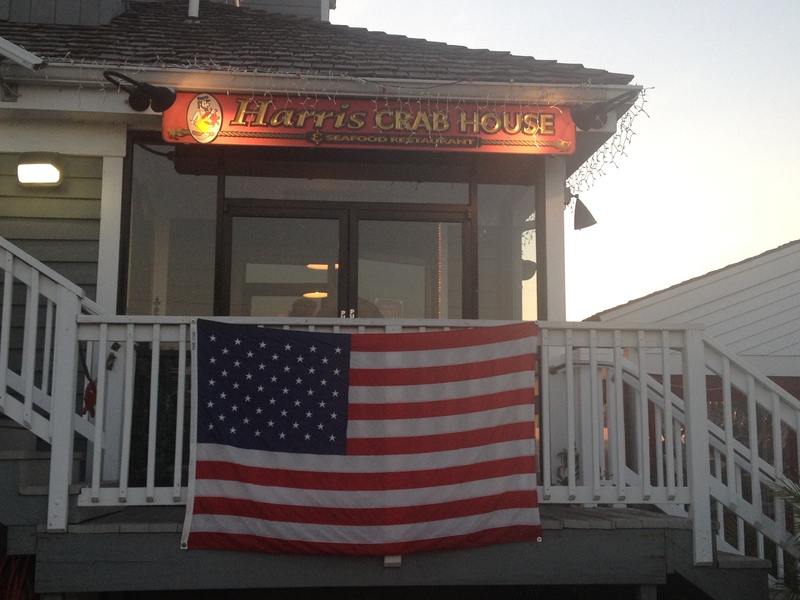 The restaurant I was taken to is called Harris Crab House, and it is right along the shore of the Chesapeake. There is nothing better than eating crab while staring right at the body of water the crab was just caught from. It is beautiful in two ways. The views here not only make me think of both the tranquility and adventure that can be achieved on water, but also reassure me of the freshness of my food while serving as a reminder of how connected the culture of this region is to the water. Not only did I get to see the sun set over the bay, something that is possible because we are east of the bay, but the stairs of the restaurant also had a marker marking the high point of the water during Hurricane Isabel. Apparently hurricanes Irene and Sandy did not bring water as high in the Chesapeake as Isabel, a 2003 North Carolina landfall. 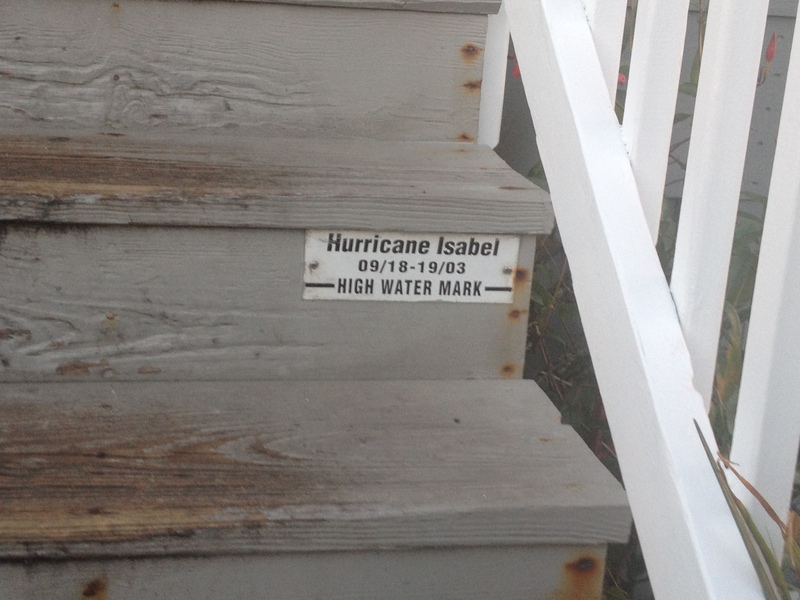 The marking labeled here reminded me how much coastal storms are also a part of life here. 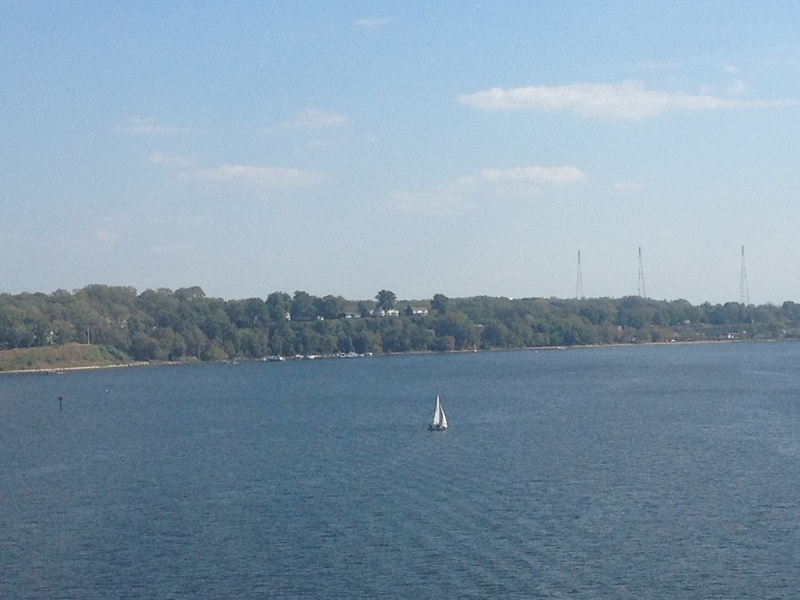 I saw plenty of boats on the water, both out in the open and docked. Many of these boats would be submerged if this event were to repeat itself. I also imagine these boats being battered by the wind, in this hurricane, the two more recent ones, as well as the dozen or so “Nor-Easters” that occur in these parts every winter. Maryland has other parts, including Baltimore city, the D.C. influenced suburbs of Montgomery and Prince George Counties and western Maryland’s mountains. However, for some reason, when I think of Maryland, and the things Maryland is most known for, I think primarily of the places and I activities I have seen here in this part of the state. It may be a while before I have another crab meal like the one I had today. In fact, I was too preoccupied with eating to take any pictures. So, I am quite glad to have had a good Maryland experience this weekend. This entry was posted in casinos, Delaware, local culture, Maryland, politics, racetracks and tagged Anne Arundel County, Bay Bridge, Casinos, Chesapeake Bay, Delaware, Dover, Eastern Shore, Maryland, racetracks, Racinos, seafood on October 27, 2013 by Stephen Jaye.